The end of the year is edging closer. Have you achieved all your financial goals yet? Maybe you’re moving forward at full speed. And your creativity is on fire, your schedule is booked out, and your new course is selling like Pumpkin Spiced Lattes on the first day of fall. But it’s time to hit the brakes and revisit one of the core reasons your business exists—to make money. Don’t get us wrong. Fulfilling your purpose and serving your clients well is a top priority. But you also desire to put food on the table (kinda important, right? ), invest in your future, and prepare for unexpected drops in sales. 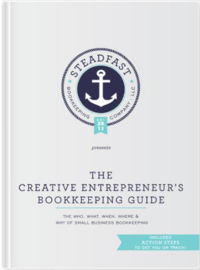 So, even if you’re in the black (that means making moolah), it’s hard out there for a…creative entrepreneur. And it’s crucial to pause each quarter and reflect on your goals and progress. Not sure how to do that? Here’s our 2017 Financial Goals 4-Point Check-In Checklist. Kept that list handy? Nice work! If you wrote it down on a sticky note and can’t remember where you stuck it, then maybe make a new one. Take your list of “achieved” goals. Grab a pen and place a checkmark beside each one. Or scratch them off for extra finality. Research shows you have stronger feelings of motivation and accomplishment when you make a list and check it (off) twice–okay, yes! We’re so ready for Christmas! The less you have on your list, the more you can focus. Plus, it’s the end of the year, and you’ve worked hard. So pick the remaining goals that excite and inspire you! Also, consider the goals under “no longer pursuing” and “forgot about.” Are these goals you still value? Why did you forget about them? Are they relevant to your business today? For example, let’s say one of your goals was to build an emergency fund. But you took extra time off this year and invested more into your product launch than you anticipated. Within the next four months, can you fund your emergency account? If not, remove the goal from your list. You want to focus only on the goals that are achievable. For example, instead of “invest in 401K”. You could set a goal to “Open Roth IRA by September 30th and fund $1,000 on October 15th”. Not sure what financial goals to make? So, tell us. What goals did you accomplish this year?